Here at Travel Excellence we are always looking for new ideas to suggest places that make your trip unforgettable and Tamarindo is a place you should experience when traveling to Costa Rica. If you want to enjoy a beautiful sunset and lay down to forget about everything, this is the perfect place. Located on the Pacific Coast, Tamarindo is a popular destination for couples and families looking for a great time. With amazing beaches and forests, this grown city has many stores, hotels and restaurants, perfect for sampling the flavors of Costa Rica. Tamarindo is a main spot for water activities like diving, surfing and sport fishing. On the top of the list we found JW Marriott Guanacaste Resort & SPA, this is an elegant hotel with 310 guest rooms and four meeting rooms. Each guest room is equipped with amenities such as A/C, private bathroom, room service, minibar, coffeemaker, cable and satellite TV, and iPod port. Other services are: baby sitter, dry cleaning, souvenir shop, 4 restaurants, 2 bars and Spa. It is an ideal hotel for couples, and honeymooners. If you want to enjoy a warm luxury atmosphere this is the place for you. For those who want to stay in the heart of Tamarindo, we suggest the famous Tamarindo Diria Beach & Golf Resort. It is located just 50 minutes away from the Liberia International Airport. This nice resort offers 124 rooms in different categories, all their rooms offer air conditioning, cable TV, telephone, coffee maker, mini bar, safety box and hair dryer. 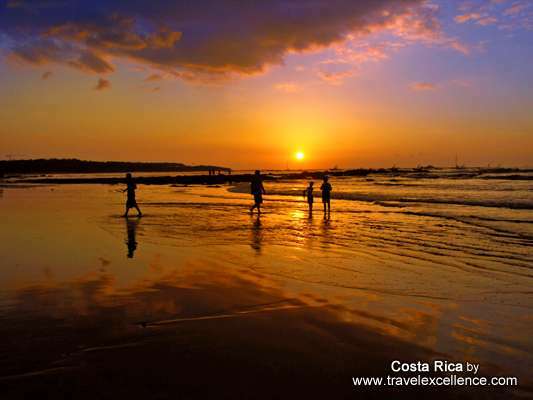 Tamarindo called by Forbes Magazine Costa Rica’s most popular beach have a long list of things to do, no matter if it is your first time in the area or not, you will find new activities to do and experience - something that you haven’t done before. For those who visits Tamarindo for the first time, people usually do the canopy tour, rent bikes, sport fishing, scuba diving and snorkeling tours, which are all some of the best ways to experience the area. But if you’re looking for a couple of new things to add to your list – here are some suggestions: horseback riding, ATV tours and surfing lessons among many others. As you can see, and probably noticed Tamarindo is a beach that has so many attractions to offer… include Tamarindo if you are considering Costa Rica as a destination for your next vacation travel.